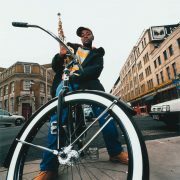 Soweto Kinch had a banner year in 2004, winning accolade after accolade in his native U.K. But to hear the alto saxophonist tell it, his most momentous experience was an autumn sojourn at his aunt’s house in the Bedford-Stuyvesant section of Brooklyn, USA. Kinch arrived in late September and stayed nearly through the end of the year-interrupting the visit only once, for a festival gig in Finland. While in the Big Apple, he mainly kept a low profile, haunting jam sessions and simply taking in the scene. Kinch has actually had no problem standing out since the release of his solo debut, Conversations With the Unseen. Originally issued by the British indie label Dune in 2003, the album found U.S. distribution in September ’04, a few weeks before Kinch’s Stateside arrival. Conversations has helped the saxophonist earn a clutch of honors-including a BBC Radio Jazz Award, an Urban Music Award and the prestigious Mercury Music Prize-along with a widespread reputation as the Next Big Thing in British Jazz (at least among those who recognize crooner Jamie Cullum for the savvy pop entity he is). Still, Kinch is a jazzhead first and foremost: His recent single, “Jazz Planet,” imagines a world in which beboppers reap fame and fortune while boy bands scrape to make ends meet. Throughout Conversations, his quartet engages in a loose-limbed yet intelligent brand of postbop. The band’s sax-guitar frontline vaguely recalls the mid-’60s Sonny Rollins group featuring Jim Hall, particularly on Caribbean-flavored fare like “Mungo’s Adventure.” Elsewhere Kinch and crew mine Lee Konitz introspection (“Elision”) and post-Coltrane modality (“Equiano’s Tears”). Kinch himself has a tart but full-bodied alto saxophone sound, suggestive of many influences but ultimately free of them. His strengths as a jazz musician outweigh his skills as a rapper, but no matter: He’s selling the total package.